Will Apple develop MobileMe as my own personal cloud? A lot is being made of cloud computing these days, especially in light of Microsoft’s Mesh initiative and the various online products and strategies cooked up by Google. With the rumored changes coming to Apple’s .Mac product, could a revamped MobileMe or Me.com — whatever it is ultimately called — eventually become my personal cloud? I hope so. My digital life needs one, whether supplied by Microsoft, Google, or Apple, it doesn’t matter. Fact is, I’m inundated with digital devices and Web-based services and all of the information generated by these — email, IMs, SMS, text, photos, videos, mp3s, blog entries, Facebook, MySpace, Twitter, Amazon, FriendFeed. I feel like the Peanuts cartoon character Pigpen, who walks around in a cloud of dust. Only my dust is digital and invisible. And honestly, I’m tired of “cleaning up” by syncing information between local hard drive(s), attached USB storage, network attached storage, and Web sites scattered all over the Internet. 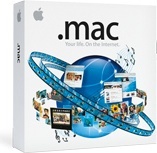 For the past six years, .Mac has been Apple’s $99-a-year bundle of Internet services, including email (with multiple aliases), online hosting, backup, file and photo sharing, and tools to synchronize calendars and address books. Between one and two million people subscribe to .Mac, according to industry estimates. Problem is, the Web raced by .Mac as if Apple was driving a Ford Fiesta and it was behind the wheel of a Ferrari. Google, Yahoo!, Microsoft, and others offer free email. Dozens of companies offer cheap online hosting for Websites and blogs. There’s Flickr for online photos, YouTube for video. There are as many as 400 companies offering online storage and backup, ranging from free to inexpensive subscriptions. Even in the eyes of the Apple faithful, .Mac has become “lame,” an “also-ran,” “a joke,” a “disappointment” (CEO Steve Jobs’ own assessment), “un-Apple”, “painfully slow,” and __________ (fill in the blank). I only use my .Mac account because of legacy email; I usually forget I even have it. Apparently change is coming. 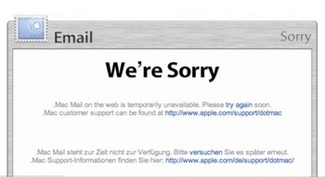 Apple sleuths from MacNN, Ars Technica, Macenstein, Macworld, and The Unofficial Apple Weblog are speculating about code in the iPhone 2.0 SDK, new domain names, patents, and the fact that Mail was “mysteriously” down this week as proof that .Mac will undergo an overhaul in June or early July. That’s all fine and dandy, but what we don’t need is .Mac 2.0 — more of the same, only updated and improved with snazzier interfaces and templates. These won’t cut it. In other words, give me a personal cloud. This cloud would facilitate my digital life, providing the invisible link between home and work computers, access anywhere, and my mobile needs without me even thinking about it. For example: I add a contact or schedule an appointment using the iPhone. Instead of going to the computer where I have my data stored to sync via a cable, MobileMe automatically syncs the date over-the-air to my MobileMe cloud. The next time I am on the home or work computer, my information is in iCal and Address Book. Conversely, I add information on a home or work computer. I don’t need to synch it to my iPhone via iTunes. MobileMe does it automatically, so when I access the contact, appointment, or note on another computer or the iPhone, it’s there, waiting. And with third-party applications coming, imagine what can be done between a desktop application, the iPhone, and MobileMe — if Apple makes MobileMe available for third-party use. For example: I use the task program OmniFocus but am immensely frustrated that the items I enter on my laptop are not available on the iPhone. That is expected to change when OmniGroup offers a mobile client for OmniFocus. I can only hope that one day I will be able to sync tasks bi-directionally through MobileMe and never be tethered to the computer again. The promise of MobileMe extends far beyond the over-the-air syncing to the iPhone. It will include the basics of automatic backup, faster file sharing and transfer, improved Web hosting and more advanced features of “personal streaming,” “squirting” (the sharing of XML files like an iTunes playlist between iPhone users), some sort of iLife or iWork capabilities, barcode applications. MobileMe may become free, ad-supported like Google and others or remain a premium service offering superior technology, design, and user experience, just like other Apple products. After all, MobileMe doesn’t need to be all-things-to-all-people like Microsoft Mesh. MobileMe can be smaller, more consumer friendly, more personal. Apple is so tantalizingly close to “getting it” when it comes to Web 2.0. It’s weird how they’ve lagged behind even MS in this regard. If they can truly deliver an open and low-cost/free “.Mac 2.0” service that integrates with third-party apps along with the iPhone, I know I will be hooked for life. I can’t imagine Teh Jobs is going to dillydally much longer on this front.